Are you in need of customized AutoCAD house plans to obtain a building permit or to work with an architect and contractor? Our team of experienced CAD designers will produce the professional drawing floor plans you need to get your project going. Send us your sketches and ideas (or your architect's) and we’ll transform them into CAD house plans for your use. We’ll work with you, your architect or designer, to develop a schedule and create the plans you need to get started on your dream home. Everything you need to build your home properly will be included in your CAD drawing package. As you know, architects fees can be quite steep. You can minimize your architectural fees by using a CAD AutoCAD house plans drafting service, such as ours, to develop your professional drawing floor plans instead of using the drawing service provided by the architectural firm. We will develop your CAD drawings according to your designer’s standards or yours, at reasonable prices. Simply have your architect fax us the design sketches and we’ll convert them into CAD house plans, in a timely manner. We’ll send the completed CAD files of your house blueprints directly to your architect for approval. We will also work with your designer or architect until all your construction documents are ready for building. We can even convert the finished architectural contract drawings to .pdf format so you can print them out easily from your home. This way, you can review them as well before meeting with your house designer. 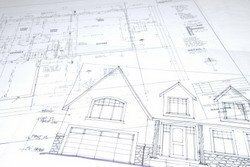 Contact Us to discuss your needs for professional house plans.